Directed by Zhang Yimou and screenplay by Carlo Bernard, Doug Miro, and Tony Gilroy from a story by Max Brooks, Edward Zwick, and Marshall Herskovitz, The Great Wall is the story of two European mercenaries who help a Chinese army fight off against a horde of mysterious alien monsters. The film is a monster movie of sorts where an army tries to fight off mysterious monsters as they get unexpected help from a couple of Europeans who travel to China to find gunpowder. Starring Matt Damon, Jing Tian, Pedro Pascal, Andy Lau, and Willem Dafoe. 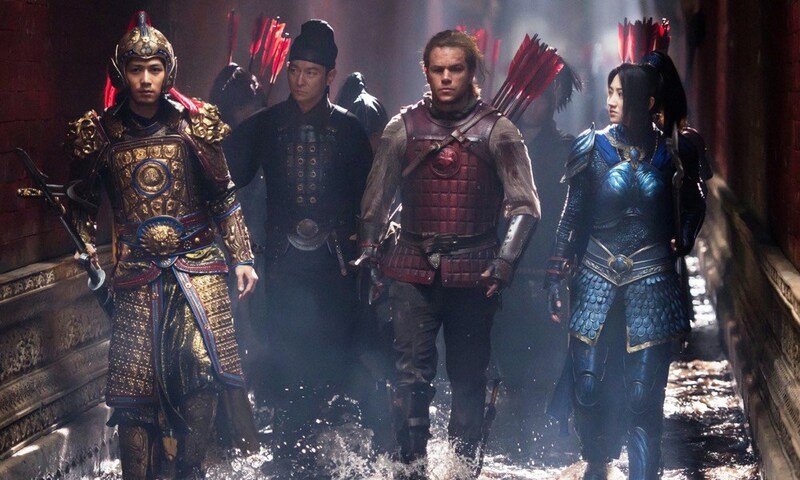 The Great Wall is an enjoyable and adventurous film from Zhan Yimou. The film is this story of two European mercenaries who encounter an alien monster and kill it where they’re later captured by a secret Chinese army at the Great Wall who are trying to stop the monsters from reaching civilization. It’s a film with a simple premise that involves two white European mercenaries who are in China to trade and steal as they reluctantly help the Chinese fight this horde of monsters that come from a meteor many centuries ago and things have gotten worse. The film’s screenplay doesn’t do much with the film’s story though a few characters are well-defined such as William Garin (Matt Damon) who is a mercenary that admits to fight for food and money as a means to survive as he is someone that is a great archer but never had a real reason to fight for something. His friend/partner Pero Tovar (Pedro Pascal) is more concerned with trying to find gunpowder as a way to give Europe a sense of power yet is also a skilled warrior himself. Yet, the monsters they encountered early in the film and brought to the attention of this army known as the Nameless Order become aware that the monsters are coming back as they’re led by General Shao (Zhang Hanyu) and Commander Lin Mae (Jing Tian) as the latter is known for her crane attack whose army attacks from the top of the wall and are pulled back after attacking the monster. Garin befriends Commander Mae and the company’s strategist Wang (Andy Lau) as they’re both impressed by Garin’s archery skill and his methods in trying to capture a monster in order to study it. Still, the script emphasizes more on action rather than development as Tovar isn’t as developed in the film as he’s more of a comic relief in some ways as he and another European in Sir Ballard (Willem Dafoe) are concerned about taking the gunpowder to Europe than help the Nameless Order. Despite these shortcomings in some of the characters as well as scenes where it played into more time over story instead of action set pieces. The film does maintain its purpose in being this action-adventure film. Zhang Yimou’s direction is definitely stylish in terms of his presentation of the action as well as creating something that is a grand spectacle with loads of extras and large set pieces. Shot on location in the Qingdao province in China, the film does play into this world that is grand with its deserts and mountains as well as fictionalized look of the Great Wall of China where it is set in this land where behind that wall is civilization and the city where its emperor lives in. Yimou’s usage of wide and medium shots does have a lot of scope and depth of field into the locations as well as what is at stake. Even in the latter as it relates to the interaction between characters as he does know when to break from the action and give time towards development on the characters and the situation they’re in. One notable scene involves General Shao and Commander Mae checking out a situation where it does have this air of suspense as it’s a key moment in the film into what is at stake. While Yimou does establish a lot of what is happening and the stakes that the characters are dealing with. He is unable to get it all together where there’s so much action and fighting that is happening as he isn’t given enough time to slow things down. Notably in one scene where a monster is captured as Garin and Wang both want to do more study on the creature and figure out what to do next but an envoy to the Emperor would take the creature to the Emperor which would be a moment of stupidity that eventually leads to the film’s sprawling climax. The fact that Yimou is hampered by a script that is more about action than character development does hurt the film a bit though he is able to provide some key moment where the characters to play into the stakes and stop these monsters from wreaking havoc. Overall, Yimou creates a thrilling though messy film about two European mercenaries helping the Chinese fight off against mysterious alien monsters. Cinematographers Stuart Dryburgh and Zhao Xiaoding do excellent work with the film’s cinematography from the colorful and naturalistic look of the scenes in the deserts to the usage of natural interior lighting for scenes inside the Great Wall and the very colorful sequence in the film’s climax. Editors Mary Jo Markey and Craig Wood do terrific work with the editing as it is stylish with its jump-cuts and other rhythmic cuts to play into the action and suspense while not deviating into the idea of chaotic editing style. Production designer John Myhre, with set decorator Gordon Sim and supervising art director Helen Jarvis, does brilliant work with the look of the interiors of the Great Wall as well as some of its exteriors and its landscape around the wall. Costume designer Mayes C. Rubeo does fantastic work with the look of the different kinds of armors and the color of those armors to represent different parts of the army as it’s a highlight of the film. Hair/makeup designer Paul Engelen does nice work with the look of Garin and Tovar early in the film before they’re captured to play into their ragged look. Visual effects supervisors Phil Brennan, Martin Hartle, Viktor Muller, Matt Russell, Sable Sanjiv, and Ben Snow do wonderful work with the design of the monsters though some of the effects are a bit wobbly in its movement though the look of some of the landscape and the crowd of people are a marvel to watch. Sound designer Kyrsten Mate and sound editor Gwendolyne Yates Whittle do superb work with the sound in the way the monsters sound as well as the weapons and the sense of atmosphere that occurs during a battle scene. The film’s music by Ramin Djawadi is incredible for its bombastic score that mixes traditional Chinese percussion and string music to play into the grand scale of the film and the sense of adventure while music supervisors Peter Afterman and Margaret Yen provide a couple of original songs in the film sung by Chinese pop artists. The casting by John Papsidera and Victoria Thomas is marvelous as it include some notable small roles from Cheney Chen as the head of the Imperial Guard who brings the monster to the young Emperor, Karry Wang as the Emperor, the trio of Huang Xan, Eddie Peng, and Kenny Lin as commanders of different platoons of the army, and Lu Han in a terrific performance as the young soldier Peng Yong whom Garin befriends and sympathizes with over the horrors of war. Zhang Hanyu is terrific as General Shao as the leader of the entire army who is mistrustful towards Garin and Tovar for being outsiders but realizes their worth in their fighting skills. Willem Dafoe is superb as Sir Ballard as a European who had lived in the Great Wall for 25 years as he is eager to get out and bring gun powder to Europe while teaching the Chinese how to speak English and Latin. Andy Lau is excellent as Wang as the army’s strategist who is one of the few who can speak English as he bonds with Garin in their interest for the monster as well as willing to see what it can do as knows that the monsters are far more intelligent than they realized as it’s an understated performance that could’ve been used in more scenes. Pedro Pascal is fantastic as Pedro Tovar as this mercenary who is more reluctant to help the Chinese in their battle against the monsters as he’s more interested in getting the gunpowder while he also has some of the film’s funniest lines. Jing Tian is brilliant as Commander Lin Mae as a young warrior who leads an army of women as she befriends Garin as she sees what he can do but also copes with the responsibility of her role as well as wondering if she can trust Garin. Finally, there’s Matt Damon in an amazing performance as William Garin as a mercenary who is also a skilled archer as someone that is reluctant to go into battle knowing he’s fought for other things where he later finds a big reason to fight as it’s a role where Damon plays it straight as well as be generous with the other actors he’s with. The Great Wall is a stellar yet flawed film from Zhang Yimou. Despite the film’s shortcomings in its story in favor of bombastic action, the film does have some nice visuals, a killer score, and noteworthy performances from Matt Damon, Jian Tian, and Andy Lau. Even as it’s kind of a minor film from Yimou in his first English-language release but it is still a worthwhile and entertaining film. In the end, The Great Wall is a good film from Zhang Yimou. I saw parts of this on TV and I thought the action at least looked very cool. I'm not sure if I'll ever go back and finish it though. @Brittani-It's not a total waste of time. It's got some good action and at least the Chinese actors got some stuff to do in the film. It's just that it's more spectacle than story. It maybe a minor Yimou film in comparison to films like Hero and House of Flying Daggers but I'll take a minor Yimou film over everything else. It's nice to see some positive thoughts on this movie. The negativity put me off completely but Ii think I might give it a go now! @Allie-People tend to take films seriously sometimes as I've become less serious over the years and just let it flow. I knew it wasn't going to be a great Yimou film but I had fun watching it. Sure, I would've like to have more attention on the story and the characters but it was still a worthwhile film. Hadn't heard too many good things about this one so I haven't been too pressed about seeing it. In fact, this might be the most positive review I've seen of it. I'll give it a go at some point. @Wendell-I'll admit that Zhang Yimou has made better films like Hero and House of Flying Daggers as I admit to watching this with low expectations being that it's his first English-language film. Yet, I enjoyed it for what it is. Once you don't take it seriously, it's just a fun film.